Potowa Rinchen Sal (Tib. པོ་ཏོ་བ་རིན་ཆེན་གསལ་, Wyl. po to ba rin chen gsal) (1027-1105) — one of the three main students of Dromtönpa, and the one who particularly received all of his main writings (Wyl. gzhung). His main students were Geshe Sharawa Yönten Drak and Geshe Langri Thangpa, who were known as the 'Sun and Moon of Ü'. Dromtönpa gave the teachings to suitable disciples, including his foremost spiritual heirs known as the ‘three precious brothers’. In particular, he transmitted the teaching to the great Potowa Rinchen Salwa, that victory banner of the teachings who was renowned as an emanation of the great elder Angiraja, and who worked exclusively for the sake of the Dharma, in both study and practice, and lived together with more than 2,000 monks. Not even for a single instant did this great master ever indulge in the eight worldly concerns in either thought or deed, and besides the immediate need to deal with comings and goings as they arose, he did not entertain any grand projects or speculations about the future. 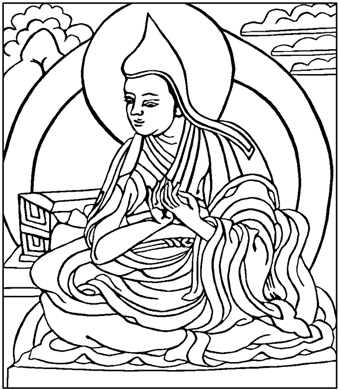 Potowa had eight great spiritual heirs, but it was to the pair renowned as the sun and moon of Ü—Sharawa Yönten Drak, who possessed the vast vision of Dharma, and the great Langthangpa Dorje Senge, who had mastery over bodhichitta—that he transmitted these teachings in secret, having first extracted the main points and condensed them into pith instructions. This page was last edited on 8 February 2018, at 23:50.